"Pat Patriot" logo used by the New England Patriots as their primary logo from 1960 (when the team was known as the Boston Patriots) through 1992. This logo is commonly referred to as "Pat The Patriot" and had been resurrected for the Patriots' white-helmeted throwback uniforms until the NFL's current "one helmet shell" rule which forbids teams from wearing more than one color helmet during the course of a season. However, Pat The Patriot can still be seen on the Patriots' sideline, appearing on official team-issued clothing worn by players such as quarterback Tom Brady's knit winter hat. Pat Patriot, commonly referred to as "Pat The Patriot," is the mascot of the New England Patriots, a National Football League (NFL) franchise based in Foxborough, Massachusetts. He is depicted as a soldier of the American Revolution. The logo version of Pat wears a tricorne hat and a Continental Army uniform. This was the Patriots' official insignia until 1993, when it was replaced by the current logo which is known as "Flying Elvis". Logo Pat was created by Worcester Telegram - Evening Gazette cartoonist Phil Bissell in 1960. Live mascot Pat Patriot running onto the field at a New England Patriots practice. In 1979 the Patriots considered replacing Pat Patriot with a new logo, mainly because Pat Patriot was very detailed and was therefore difficult to replicate accurately on various promotional materials and merchandise. Unsure if this would be a good decision for the team, executives decided to let the fans vote for the logo they preferred during halftime of a Patriots' home game. 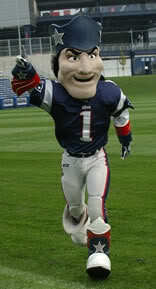 Pat Patriot was the overwhelming victor. The live mascot Pat was originally developed in the early 1990s and made one of his first public appearances at the 1995 Pro Bowl as a Team NFL Hero. Team NFL Heroes were a line of mascot-like characters developed by NFL Properties; most of the characters only lasted a season or two but a handful ended up being adopted as official mascots by their respective teams, either immediately after the Team NFL Heroes project was canceled or years later with Pat being an example of the former. The live mascot Pat we know of today was intended at first to be a completely different character from the Pat Patriot logo; this is supported by the fact that Pat's name was listed as "Revere" (a reference to Paul Revere) on Team NFL Heroes merchandise. Live mascot Pat wears either the Patriots' home uniform which consists of the navy blue jersey, number 1, with silver pants or the away uniform which consists of the white jersey, number 1, with navy blue pants. Which uniform Pat wears depends on which uniform the team wears in the game he is appearing at. Pat previously wore jersey number 0 until a fan approached team owner Robert Kraft and asked if the number could be changed. This interaction was caught on tape by NFL Films and shown on television. Pat has represented the Patriots as the team's live mascot in ten of the eleven Super Bowls the team has appeared in: XXXI, XXXVI, XXXVIII, XXXIX, XLII, XLVI, XLIX, LI, LII and LIII. From 2009 to 2019 the person inside the live mascot Pat costume was Adam Visbaras. ^ Palma, Briana (January 16, 2015). "Pat Everlasting". New England Patriots. Retrieved February 19, 2015. ^ Caputo, Paul (January 23, 2016). "Now to Make Some History: The Story Behind Pat Patriot". SportsLogos.net. Retrieved February 19, 2018. ^ Lukas, Paul (July 28, 2011). "The untold story behind the Patriots logo". ESPN. Retrieved February 19, 2018. ^ Gaines, Cork (September 10, 2017). "In 1995 the NFL used some bizarre mascots that were never seen again". Business Insider. Retrieved February 19, 2018. ^ Bagni, Adam (January 27, 2017). "Only on 10: Patriots mascot reveals identity". WBTS-LD. Retrieved February 19, 2018.